Tiger Barbs are a good choice for beginner aquarists that wish to breed fish, since Tiger Barbs frequently spawn in aquariums without much pampering. They are hardy and will accept a wide range of temperatures. If you choose a high quality flake food they will do well on a prepared food diet, but it is always recommended to sometimes supplement the flakes with more meaty foods such as Daphnia, bloodworms or similar. More information regarding suitable food during the breeding period can be found further down in this article. The Tiger Barb is an active fish that can reach a size of 1.5", so make sure you have enough space to keep the produced fish in before attempting to breed them. 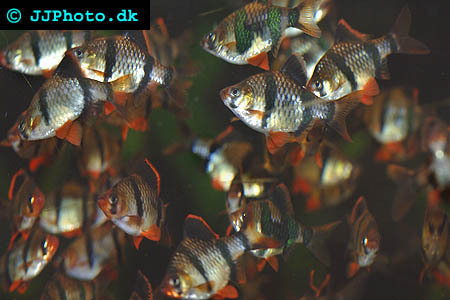 Since Tiger Barbs do not raise their offspring, one Tiger Barb batch is usually very large to make sure that at least a few of the fry survive. This means that you might have to cull the batch if you do not have a very large aquarium for the fry to grow in. If you refrain from culling and instead let them grow up in a crowded aquarium, the whole batch will suffer. If you want to breed Tiger Barbs, you must start with separating the males from the females. It is true that healthy Tiger Barbs sometimes spawn when kept together in community aquariums, but this it is not something that happens very often and if you want to induce spawning you should separate the sexes from each other. The smallest Tiger Barbs with the plumpest bodies are the females. When you have separated the sexes you should start feeding them a spawning-inducing diet. Tiger Barbs are happy eaters and will usually consume anything you give them, but breeding Tiger Barbs require a diet rich in protein to do well. Freeze dried Tubifex is known to induce spawning in Tiger Barbs, but other protein rich food types can also work well. Live food is always a good idea. The temperature in the aquariums where you keep your Tiger Barbs should stay around 80 degrees Fahrenheit. After 3-4 days of separation you should let the Tiger Barbs see each other again. The aquarium where you want them to breed must have slightly soft water, and the pH should be a bit acidic. Just like when they were separated, the water temperature should be kept close to 80 degrees Fahrenheit. A mature sponge filter will help you keep the water conditions optimal. You must also provide your Tiger Barbs with suitable spawning sites, such as two bunches of Cabomba plants or a pair of spawning mops. 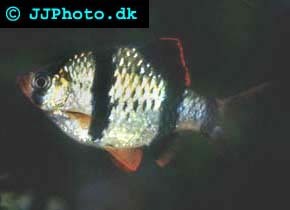 A Tiger Barb in breeding condition. Spawning will usually begin very soon when the Tiger Barbs have been brought together again. During the courting period, the male will chase the females. When a female Tiger Barb starts releasing her eggs at the spawning site the male will follow her and leave a trail of sperm in the water. When the spawning is over you should remove the adult fish from the rearing aquarium, since Tiger Barbs are known to eat their own offspring. If you have covered the aquarium floor with marbles the eggs will be safer since the eggs can fall down between the marbles where the adult fish can’t reach them. If you keep the water temperature in the aquarium at 80 degrees Fahrenheit you can expect free swimming fry after approximately five days. The fry will usually cling to the sides of the aquarium. Newly hatched brine shrimp is a suitable first food for Tiger Barb fry. Powdered flake food will also work, but the growth rate will be slower and powdered flake food is not recommended for larger Tiger Barb fry. If the newly hatched Tiger Barbs are very small, you can feed them liquid fry food until they are big enough to eat solid food. Tiger Barbs are commonly sold to pet stores when they are around three months old. The result of successfully breeding tiger barbs.